Instead of a 'Game Record' for each player to record their journey at the end of the lesson, students could map out their journey to the 4 different stations for each round and compare and contrast the pattern of their journey between the two. "Want To Do More?" suggestions are good for elaborating on the learning. Focus of the activity is how human activities have changed the distribution of carbon among Earth's atmosphere, lithosphere, biosphere, and hydrosphere. Compares the carbon cycle before the Industrial Revolution with the carbon cycle after humans began burning large quantities of fossil fuels. Comments from expert scientist: A neat approach to understanding the carbon cycle, the magnitudes of the flows, and humans--incorporates physical activity and probability. The activity doesn't communicate the size of each stock, only the flows between them--a really important part of the basic carbon cycle concept to communicate. The activity outlines questions for each section of the game, suggesting stopping points for students to think and evaluate what they have done to that point. Provides additional activity ideas such as story boards and graphing the data. 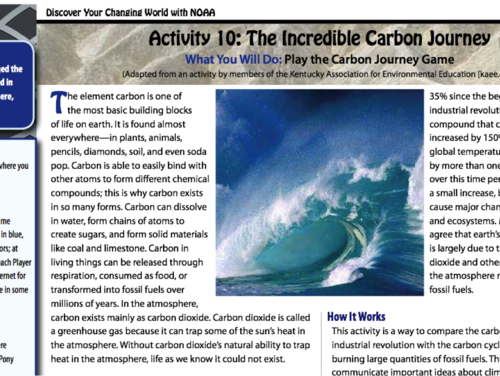 Activity is one of 10 in the NOAA activity book Discover Your Changing World with NOAA [link http://oceanservice.noaa.gov/education/discoverclimate/]. Must build game cubes; templates are provided.